The San Diego Stars 11u squad played up as 12”s this past Sunday and although it was four tough games, in the end we came away with the trophy once again. Winning this tournament was no small feat considering we were without our number 4 hitter and big time pitcher Carlos Oquita. Game 1 was a 5-3 victory over the East County Rattlers. Although the game was a bit sloppy, Heath Miller and Wyatt Lannom each got 2 hits and an RBI coming through on the offensive side, while Ej Edelman and Antonio Garcia did their jobs on the mound holding the Rattlers to only 1 earned run. Game 2 was essentially a semi final game against a tough Murrieta Redhawks team and this was the game of the tournament. It was a back and forth game that saw the Stars take a 1 run lead in the top of the 5th (on EJ Edelman’s first career HR) only to give up 5 runs in the bottom half of the inning. As they have done so well recently though the Stars fought back in the top of the 6th with 6 runs of their own to take a two run lead. That 6th inning started with a big hit from Peyton Berroth and was followed by singles by Octavio Corona, Emilio Luna, Keoni Cavaco, Zavien Watson and then EJ Edelman once again came through. Keoni Cavaco came in to get the one out save as the game ended in the Stars favor 9-7. Everything was on the line for the Redhawks in Game 3 and it showed as they eased their way to a 12-2 victory which meant Game 4 would be the one that decided the tourney and it ended up being no contest. Already up 1-0 coming into the top of the 3rd Brodie Romero and Antonio Garcia hit back to back homeruns to pretty much seal the deal. Ben Hart was the Star of the game though, throwing a 2 hit complete game, as the Stars came out on top 7-1. Congratulations to the following San Diego STARS for being selected in this years Major League Draft. Good luck with your professional careers! Congratulations to the 12U San Diego STARS! 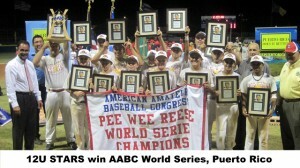 The STARS won the AABC World Series in Puerto Rico…beating a very tough Dallas Tigers team twice on the final day. By winning their 3rd World Series in 4 years the boys have set a very high standard for the STARS “Elite High School Prep Propgram”. The team heads to Memphis, Tennessee at the end of the month to participate in the nationally televised NYBC tournament sponsored by Major League Baseball. Congrats – High School Prep Program Victory! Our first HSPP team won the first,ever high school prep league championship. They entered playoffs as the one seed giving them a by to the semi-finals. We beat the San Carlos Angels 6-5, with a walk off homerun by Auggie Filiberti. We faced Mira Mesa in the finals, in the bottom of the 7th, down 8-9, 2 outs, runners on 2nd & 3rd, With a 3/2 count, Brandon Teichian hit a double down 3rd baseline, giving us a 2nd walk-off win with a final score of 10-9. The San Diego STARS had a great Memorial Weekend. 6 teams entered and all 6 played on the final day. 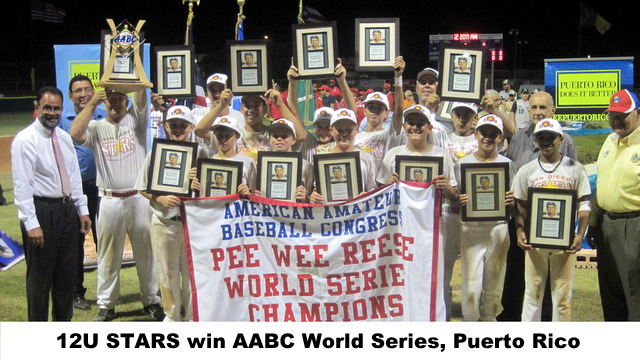 The 10U and the 12U continued their dominance by winning their respective tournaments. 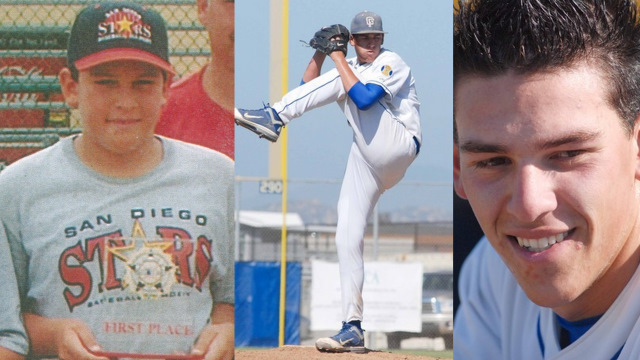 Follow former San Diego STARS as they continue their baseball careers. 9U – San Diego STARS… 1st place…beating the San Diego Mashers in the semi’s and Garden Grove Damage in the Championship game by a score 20 – 2 Winning pitcher- Ben Hart. Homeruns Emilio Luna (2) Keoni Cavaco (1) Tournament MVP Antonio Garcia.